ESO first introduced HD video as a format for its public videos in 2008 and we now have over 1600 videos in this format in our video archive. The newer Ultra HD format has now been added as one of the many video formats that are offered for parts of the video collection . The Ultra HD format  has twice the horizontal and vertical resolution of the standard 1080p HDTV format — four times as many pixels. The format has been under development since 2003, but rose to prominence in 2013 and has since become standard on many high-end TV displays. This popular new format has also recently had a lot of media exposure, including extensive coverage at the International Consumer Electronics Show, which took place in late 2013. Ultra HD content is so far quite difficult to find, although internet streaming services such as Netflix and Amazon Instant have announced that they will soon start to deliver Ultra HD video. 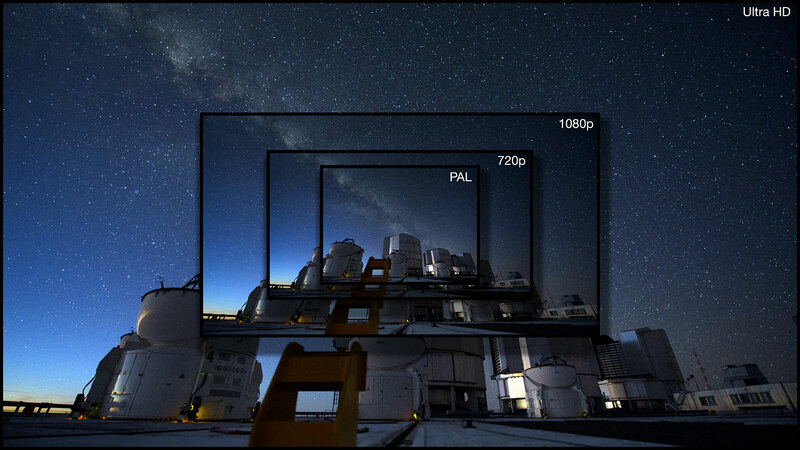 ESO will be the first scientific organisation to deliver Ultra HD video at regular intervals. ESO’s collection of Ultra HD videos will gradually expand as it is supplemented with new videos. ESO offers three different qualities of Ultra HD videos. Two are for screen viewing — compressed with the efficient Advanced Video Coding H.264 compression and the brand-new High Efficiency Video Coding H.265 compression. And one is for broadcasters (using the Grass Valley HQX codec in an AVI wrapper). Ultra HD measures 3840 pixels × 2160 lines (8.3 megapixels, aspect ratio 16:9).